Jamal Khashoggi, a Saudi critic and journalist, vanished after visiting the Saudi consulate in Istanbul last week. Surveillance-camera footage of movements in the Saudi consulate is said to have vanished. It’s not clear what was in it. Local employees were also asked to take a vacation the day Khashoggi visited the consulate, Middle East Eye and the Turkish newspaper Hurriyet reported. A Turkish pro-government newspaper also identified 15 suspects in the case who it said arrived in Istanbul the day Khashoggi disappeared and returned to Riyadh shortly after. Turkish officials said they would search the Saudi consulate while appearing to soften their tone, as an adviser to Turkey’s president refused to attribute blame to Saudi Arabia. Surveillance-camera footage of the Saudi consulate in Istanbul has mysteriously disappeared, Turkish authorities said, as investigators continue to look for Jamal Khashoggi, the Saudi journalist and critic who vanished after entering the building last week. Officials are also looking for a black van with diplomatic plates that was seen leaving the Saudi consulate about two hours after Khashoggi entered, The Guardian reported, citing Turkish authorities. It left alongside five other cars, but authorities are focusing on one vehicle with blacked-out windows that they believe was carrying Khashoggi’s body, The Guardian said. Turkish TV on Wednesday morning aired footage of the van in question leaving the consulate for the consul’s house, according to The Associated Press. Khashoggi, 59, a prominent Saudi critic who wrote columns for The Washington Post, disappeared after visiting the Saudi consulate in Istanbul on October 2. Khashoggi, who had been living in self-imposed exile in the US for the past year and was said to have feared for his life, entered the consulate to obtain documents to finalise his divorce so he could remarry, the BBC reported. His fiancée said she waited outside for at least 11 hours and never saw him come out. Middle East Eye, a London-based news website focusing on Middle East news, reported on Tuesday that it had confirmed a report in Turkey’s Hurriyet newspaper that the Saudi consulate asked its 28 locally hired employees to take the day off on October 2, the day Khashoggi disappeared. Consulate employees were ordered to wear voice recorders and cameras in the days following Khashoggi’s disappearance, and the locks and keys to a few doors in the compound were changed, Middle East Eye reported, citing Hurriyet. The Turkish foreign ministry said on Tuesday that it would search the premises and that Saudi officials had agreed to cooperate,Turkey’s pro-government newspaper Daily Sabah reported. It’s not clear when the search will take place. Another Turkish pro-government newspaper, Sabah, also on Tuesday published photos of 15 people whom the newspaper identified as part of an intelligence team from Saudi Arabia involved in Khashoggi’s disappearance. All of them arrived at Istanbul’s Ataturk Airport on October 2 and left the country at different times, Sabah reported, citing photos it said were taken at passport control. It did not say how it got hold of the identities and footage. The Guardian reported on Tuesday that two corporate jets rented from a company often used by the Saudi government arrived in Istanbul that day and left separately that evening. One left for Cairo and the other flew to Dubai, but flight-tracking records showed that they ultimately landed in Riyadh, the newspaper said. Turkish investigators believe the surveillance footage from inside the consulate was on one of those jets, The Guardian said. Sabah’s report corresponded with a Reuters report earlier this week that described a Turkish security official as saying that a group of 15 Saudi nationals arrived in Istanbul, entered the Saudi consulate, and later left the country. Erdogan on Monday asked Saudi Arabia to prove its claim that Khashoggi left the consulate, Reuters reported. 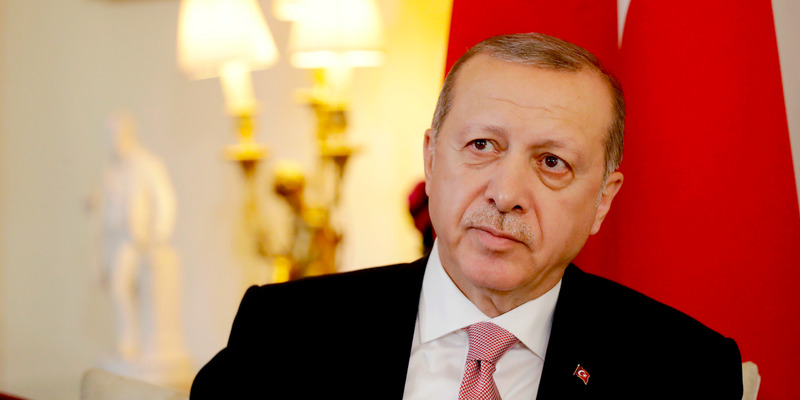 Matt Dunham – WPA Pool/Getty ImagesTurkish President Recep Tayyip Erdogan. Countries including the UK, US, and Canada have expressed concern and asked Saudi Arabia to provide more information. Jeremy Hunt, the UK foreign secretary, tweeted on Tuesday that he had asked the Saudi ambassador to Britain “to seek urgent answers” over Khashoggi. “If media reports prove correct, we will treat the incident seriously – friendships depend on shared values,” Hunt said.